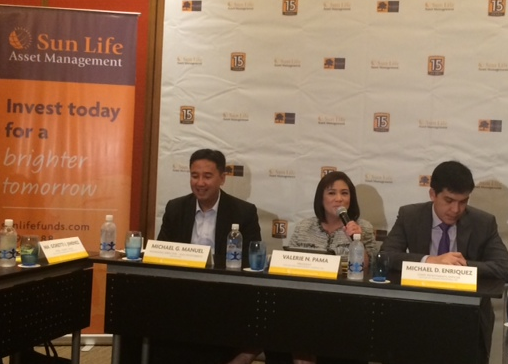 Sun Life Asset Management Company, Inc (SLAMCI) is marking another milestone this 2015 as it celebrates its 15th anniversary in the industry. <>Currently the largest non-bank affiliated asset management company in the country with almost P47 billion in assets under management (AUM) as of December 2014, Sun Life Asset Management Company, Inc. (SLAMCI) has gone a long way since it started its operations in 2000 with three funds totaling just over P150 million in AUM. It now manages eight funds collectively called the Sun Life Prosperity Funds---Bond Fund, Balanced Fund, Equity Fund, Money Market Fund, GS (government securities) Fund, Dollar Advantage Fund, Dollar Abundance Fund, and Dynamic Fund. “We’re extremely proud of what our company has achieved in the past 15 years in serving the Filipinos, because it shows how we’re able to help bring them closer to achieving prosperity and financial security,” said SLAMCI President Valerie N. Pama. SLAMCI has pioneered several firsts in the industry such as introducing the Money Market Fund with zero sales load, creating the first ever television commercial on mutual funds, holding financial planning sessions, and launching exciting investor promos year after year. Today, the company continues to innovate and improve. Through its 2,449 financial advisors and 10 bank partners, SLAMCI’s number of active clients has grown to 60,776 as of December 2014–marking a 21% growth from the previous year. SLAMCI also made a new record when it launched the Sun Life Prosperity Dynamic Fund last year, which generated P2.8 Billion in gross sales in only a month’s time. Meanwhile, as of November 2014, its Balanced Fund remains to be the largest mutual fund in the country. As it celebrates its 15th anniversary alongside the 120th anniversary of its parent company Sun Life of Canada (Philippines), Inc., SLAMCI will be rolling out several initiatives in line with its mission of helping clients achieve prosperity. “Distribution channels are set to be expanded further, new products will be developed and launched in the market, more financial planning sessions and investment forums will be held, and the company’s digital presence and online capabilities will also be strengthened,” Pama shared. Among the initial offerings are the Invest for Rewards promo, wherein investors will be rewarded with credits to top online merchants; and the partnership with COL Financial, wherein five (5) of the Sun Life Prosperity Funds will be made available to internet-savvy investors.